My brother Robert and I had the privilege of heading to Major League Baseball’s All Star Game last week and we attended all of its festivities. 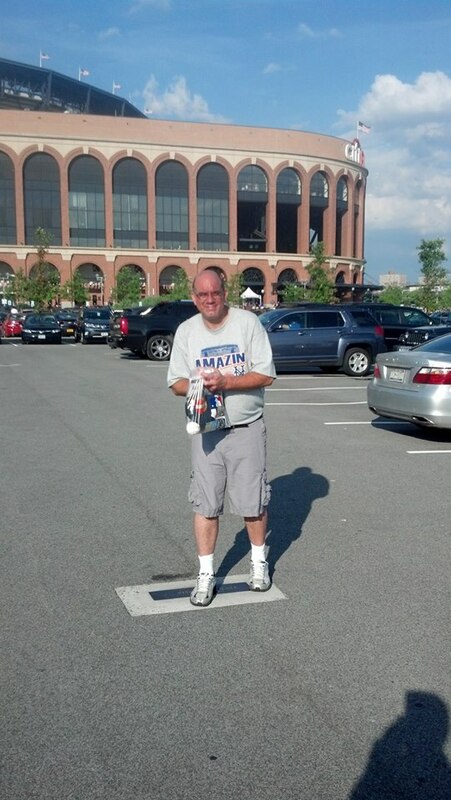 This year’s setting for the annual Baseball Extravaganza was Citi Field in Queens and since 1964, the last time the Mets hosted the party, I had always dreamed of getting to go and experience the magic in person. When it all came together it just seemed too good to be true but last Sunday after church- there was Robert and I heading up the Garden State Parkway for three days of what would turn to be priceless memories. We got up close and personal with such baseball greats like Cal Ripken Jr., Ozzie Smith, Gaylord Perry, Rollie Fingers, Bert Campaneris, Andre Dawson, Fred Lynn and Lou Brock just to name a few. I got to meet and talk with some famous sports radio personalities like Ed Randall and Christopher Mad Dog Russo. We got to see celebrities such as the King of Queens Kevin James and Alyssa Milano mix it up on the softball field with past Mets superstars Doc Gooden, Daryl Strawberry and Mike Piazza. We oohed and aahed as the Home Run Derby took place with guys like Prince Fielder, Bryce Harper and the winner of the competition- Oakland’s Yoenis Cespedes hitting moonshots into the upper decks of the ballpark they said that it couldn’t be done in. But whatever I do these days comes with an adventure and a new story to share and that is what I really want to share with all of you today. Robert and I had taken the Seven Subway Train to Citi Field all through the madness because the city exhorted us to make sure that we use public transportation. They promised that it would be everyone’s best bet to get to and from the ballpark safely. They lied. On Monday night after the biggest crowd that Citi Field had ever had come witness an event was dismissed; and after the final dinger blasted during the derby was landing somewhere in Brooklyn–about 10,000 of us attempted to make our way back to the train station. It was a hot, steamy and humid night and human beings could not have been packed any tighter or closer together as we moved like a giant amoeba to the gates. Sardines have more room to move than we had but inch by inch we advanced to the steps leading up to Subway Number Seven and that is when we sensed that something stunk in Denmark worse than the body odor being emitted by the crowd. To make matters even worse, I got a migraine and my vision disappeared as everything got blurry so I depended on my brother to navigate me out of the stormy sea of humanity. People were frustrated. Others were angry. I was unable to move. If Robert didn’t have the wherewithal to keep his head and come up with a solution–I might still be sitting out there in a comatose state.
. And then the tune changes along the pilgrimage from delight to despair. And what you thought you could depend upon has been deleted from the options with no alternative routes even suggested, never mind provided. I can’t help but think about all the times I was promised the stars but didn’t even get a moon rock. Oh sure, maybe I got to the party, but when it was over and when I got overwhelmed and when I needed somebody to lead me home, I was left stranded and alone. Unless I was willing to humble myself and look up, I would have been rendered busted and bewildered. People can put God down, but the day will come for each and every one of us that we will need the Lord to lift us up. This world can’t keep its promises. It is not big enough to be able to provide us perfect passage to and from the Promised Land. Who will you call upon when you are dumped in the dust and are heaving from the heat and your head aches and your heart hurts and you are left without a way back to where you know you belong? That is the time you need to look up and give it up to God because only He has the power and presence to come through and finish perfectly what was sabotaged improperly. It cost us $75 via taxi cab to get back to Manhattan just so we could catch the Path Train back to Jersey. Robert came to my rescue and my younger brother saved the day for his older brother. That might have ended the excursion for some but I have come to expect some detours even on the way to paradise. And this much I do know, that when my final inning of my life has been played, I won’t have to worry about fire on the tracks keeping me from going home. Jesus paid the price and took on the heavenly assignment of bridging the gap between where we are and where God has prepared a place for us to be. And when He comes a calling, there will be no delay and no let downs. He will deliver on what he has already promised and that keeps me from becoming frustrated, hopeless and stranded. How about you? Had to be a truly memorable experience. Especially since it was not a Mets game.